Modern and Contemporary Inspiration - Floors, Etc. A harmonious marriage of classic and modern innovation, clean and contemporary, skylines and skyscrapers, smart apartments, urban living and modern or industrial architecture; laid back pale oak wood floors either in wide planks or a contemporary oversized parquet block floor. Think patterns and geometrics in smooth and textured surfaces on feature walls combined with modern neutrals with splashes of colour mixed with copper and metallic silver. 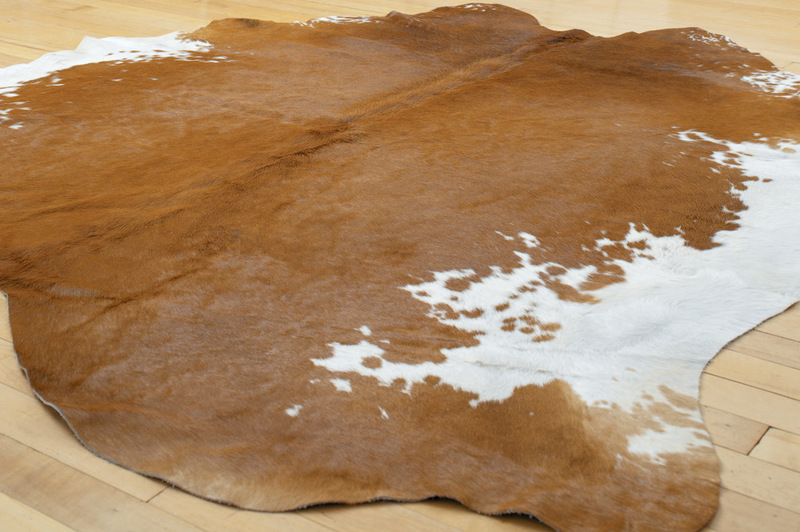 A classic rug with a faded lived in look relays again that iconic classic look with a contemporary twist this not only softens the look but gains another layer of interest and texture. Adding design classics like the bourgie lamp by Kartell that both arouses emotion and draws attention or a Florence knoll sofa, more stylish than 007, which shouts minimalist luxury at its best complete the influences behind this look. 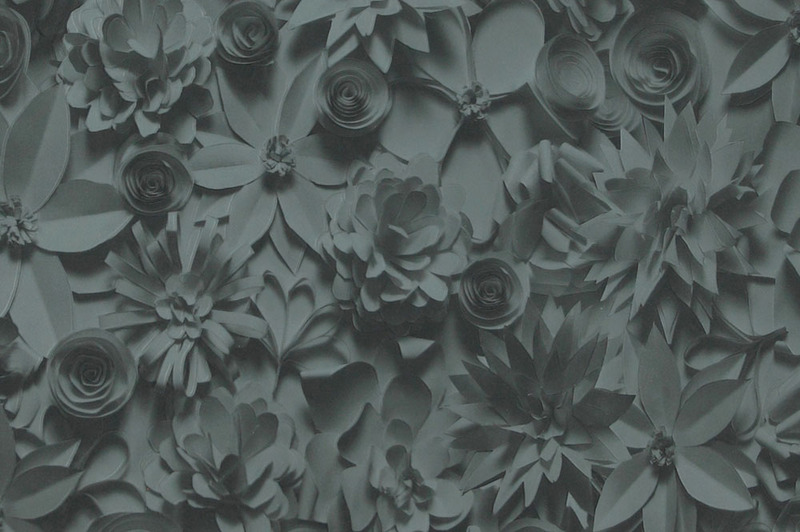 Wallpaper, the feature wall is in charcoal black with laser cut flowers from a fabulous contemporary range inspired by paper folding, geometrics and patterns in modern neutrals with option in metallic copper and silver. The main event the beautiful wood floor shown here in contemporary oversized engineered oak Parquet block Floor in the stylish classic herringbone design, Blonde in tone and provides a pale modern look with just the right amount of warmth. A dark inlaid linear wood strip has been added to the perimeter giving definition and can highlight special features of the room, a bay window or fireplace etc. 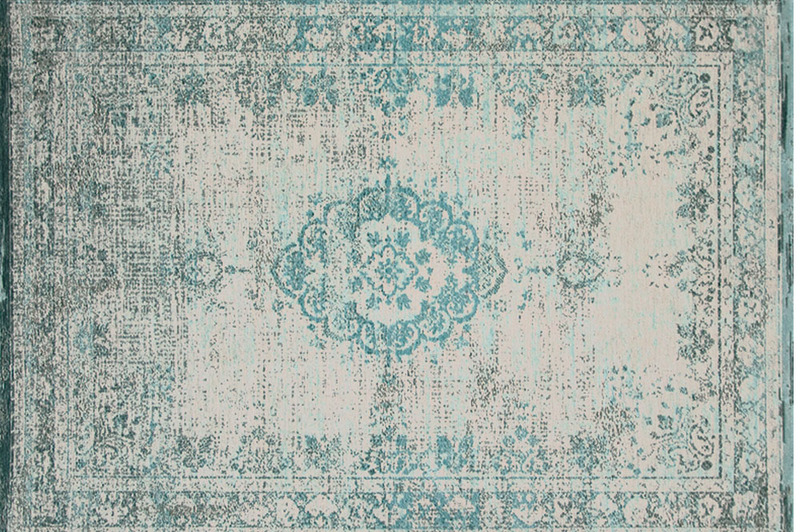 The faded vintage Rug featured gives a contemporary twist on a traditional look which adds to this iconic relaxed style. 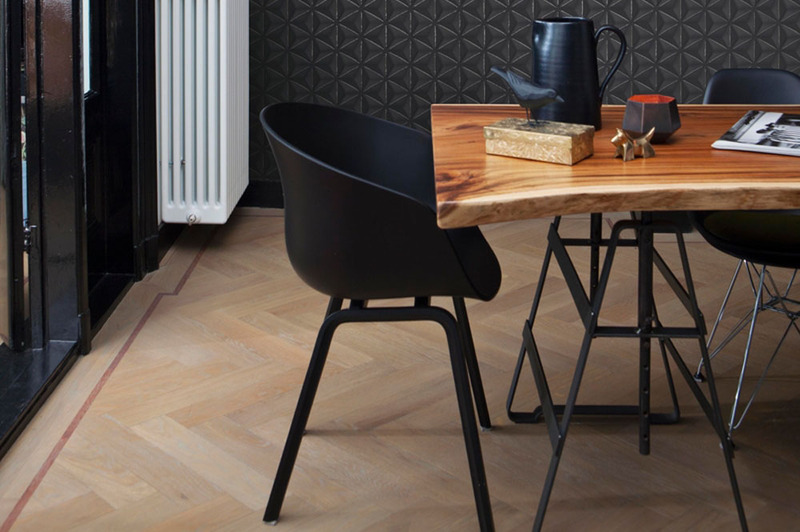 A further continuation of this style is carried through to the dinning experience where the legendary sculptural shaped and universal appeal of the Eames DSR chair or “Eiffel chair “as often referred to for its distinctive chrome shaped legs has been used, seen here looking striking in black against the pale wood floor. 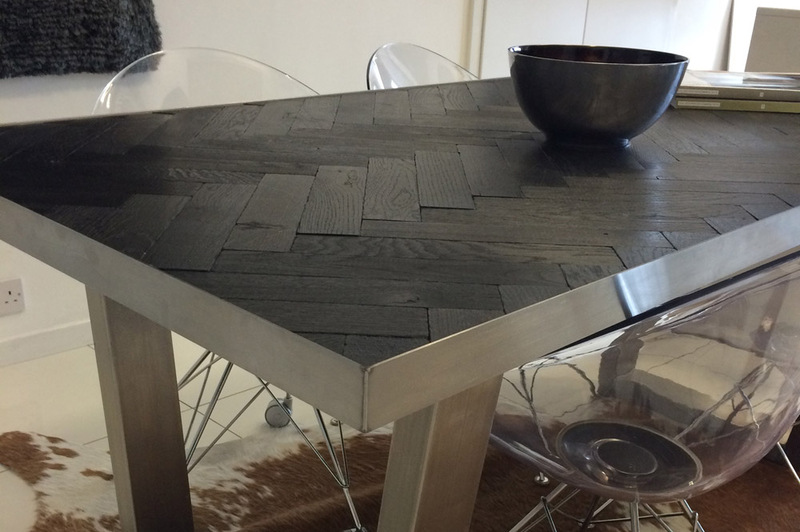 A simple metal and old worn wood plank table gives a relaxed functional modern feel for entertaining with friends. 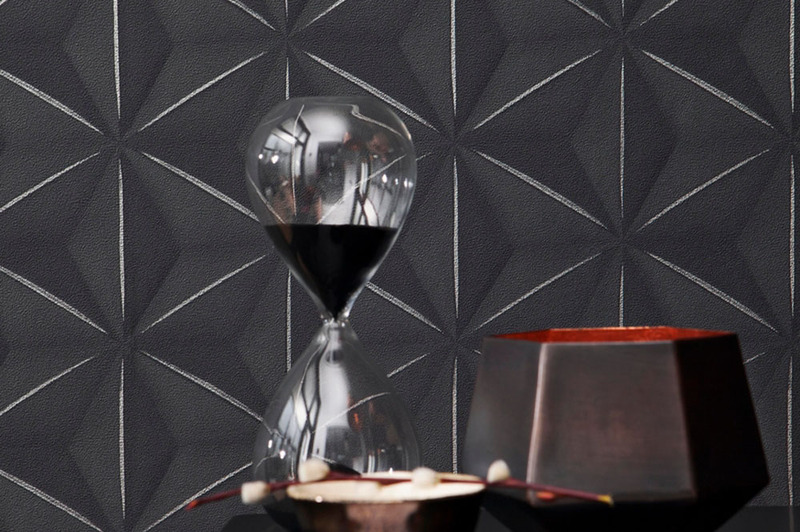 Wallpaper, stylish 3D geometric design in charcoal for that striking feature wall from our design conscious contemporary range inspired by lazer cut geometrics in modern neutrals, copper and silver metallics. Again the star of the show a fabulous oak floor shown in a contemporary oversized engineered oak Parquet blocks or Wide Oak plank Flooring both would work well and are from our pale oak range of wood flooring, a muted palette of neutrals providing graduations of warmth in bespoke finishes Blonde, Bare, and Pale Intrigue each hand finished with light patina pigments and finished with a hardwearing hardwax oil. These colours would all work well for this modern contemporary look . 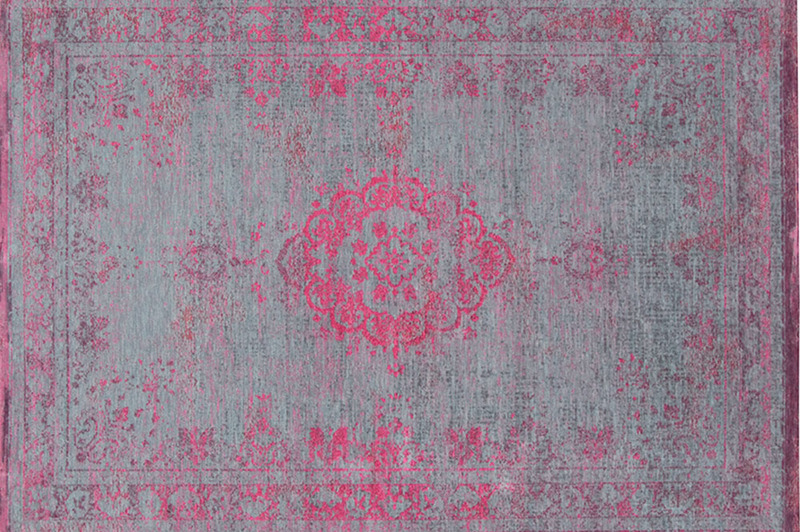 The faded style Vintage Rug featured in grey and turquoise and below in a pink tone are over dyed and distressed to create an authentic vintage look, woven on wilton jacquard looms using a blend of pure wool and cotton chenille, the heavy flat weave perfectly suits the look of these stunning rugs the edges are folded and hand sewn which add to the tactile authentic look, available in a range of 17 soft worn faded colours highly durable and easily maintained and give a contemporary twist on a traditional look all of which would add to this iconic relaxed style. Or consider the brushed stainless steel and old worn reclaimed parquet block dinning table which fits effortlessly with this design, showcased by the hardwearing Cowhide Rug and iconic Kartell chairs shown here with the famous eiffel legs.